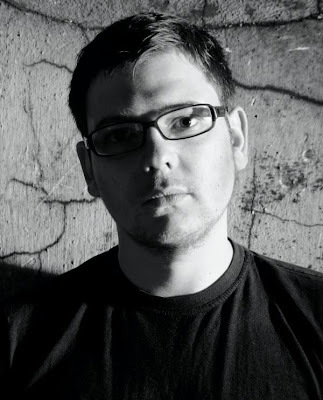 Minus the chiselled jaw line I’m not sure if it is possible for anyone to be any more techno than Fachwerk insider Sascha Rydell. Rydell belongs to a city where it’s not out of the ordinary for a cab ride, falafel house or convenience store to be soundtracked by minimal mixtapes from the early 2000’s or Jeff Mills. Rydell like many Berliners has experienced the cultivated swing of Berlin's club scene and has seen first hand illegal basement raves now become events listed on Lonely Planet’s travel guide. This is a good thing insists Sascha, who in his twenties frequented clubs like WMF, Tresor, E-Werk and Walfisch with two chaps known as Roman Lindau and Mike Dehnert, friends he now considers brothers. The three together have helped create and develop a definitive Berlin sound, aesthetic and ethic with influences harking back to the scuffled dub templates of Basic Channel. Rydell's ability to blend dubby Berghain tackle with deeply reflective grooves and ponderous chords is what makes the Fachwerkian Sascha Rydell so perfect to listen too. TEA caught up with our production dreamboat to talk of his love for the French, the Sascha Rydell remix and life outside of Fachwerk. How has your 2011 been so far? So far this year has been pretty good. It started out with our label night at the Berghain, followed by several showcases in Europe which received a great reception. Mike, Roman and I finally performed togther as a three piece. At the moment that kind of live act is reserved for exclusive events. Roman and I also started working with Octopus booking agency and I am really optimistic about my future with them. In terms of releasing music, how prolific do you plan to be? Are you happy with the amount of material you are releasing at the moment? I am happy with the amount of music I am producing right now, but I am planning to step it up to a higher level since getting some great feedback for my Marmonner release. I am very strict in what I release, every piece I produce owns a part of my soul which expresses experiences I've gained through music over the past ten years. I like to consider my music as an art form rather than something disposable. Will any Sascha Rydell material see a home outside of Fachwerk? Yes. I can imagine it happening and I'm pretty sure it will. Of course it is always a challenge to publish music for a different label as you must take into account everything that specific label stands for whilst expressing your own sound. The most important thing is that the label suits me and that I fit the label. If people are interested and the timing is right then I would certainly be excited about working with others. 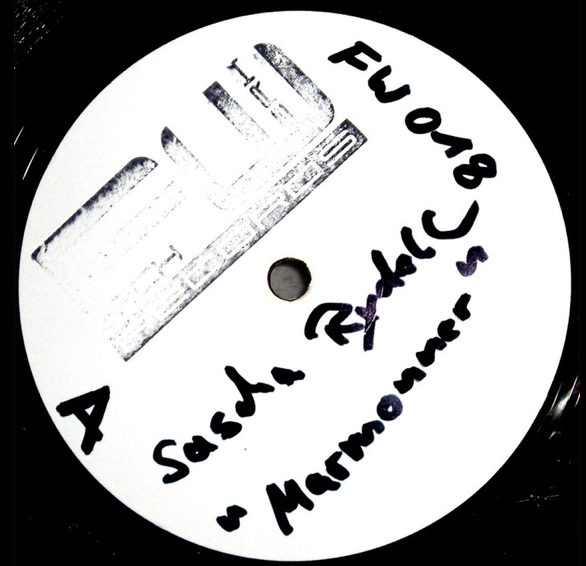 Will we ever witness a Sascha Rydell remix? Oh yeah, absolutely! There is always something special about doing a remix. Getting the chance to interpret a track in your own way is a huge honor. When remixing someone's work there has to be a connection between the track and myself. You have to feel it, otherwise you won’t be able to put all your thoughts into the production. You have to fully trust that song. Tell us a bit about your relationship with Mike Dehnert and Roman Lindau. Mike is the boss and Roman is the joker, does this leave you somewhere in the middle? We are all friends through our passion for making good music, especially electronical music. We were all born in Berlin and grew up together doing your usual teen stuff. We used to go clubbing at WMF, Tresor, E-Werk and Walfisch during our twenties, we used to take so much away from these nights. We were not necessarily restricted to techno but also Hip Hop, Jazz , Soul and so on. You can still hear those influences in most of our tracks, there is always something groovy and housy in them. Berlin was really exciting during the nineties, totally different from what it is now. We have all developed with the city of Berlin over the past 20 years. Regarding Mike, Roman and myself, we have a great relationship, fitting each other perfectly. There is this confident feeling between the three of us, like being brothers. So I guess if I am in the middle of the two I should be referred to as the gentleman of the group. How does the dynamic work between the three of you? Even though we are completely different, we all have the same taste and the same understanding of producing a track, therefore complementing each other perfectly. We catch up once a week for discussions on the label and new tracks, we also help each other out with our work and in doing so makes sure anything that we release is best for the label. In the end our diversity is reflected in the Fachwerk sound. Each of us bring our own individuality to the label and there are no limits set by anybody, not even by Mike, the initiator, founder and Motor of the label. Tell us a bit about Sascha Rydell pre 2009. What were your influences and how did you get into production Was it a long process? Electronic music has always been present in my life, you couldn’t escape growing up in Berlin. In the middle of the nineties I bought myself a turntable and haven't taken my hands off it since. Over time I happened to play in a few different clubs around Berlin and producing was a direct consequence of this, I wanted to make my thoughts on music a reality. At the beginning of 2000 I started focusing on producing, first just putting simple loops together until my first “real” track was released in 2007. You used to throw parties in Berlin. How was that and how do you find the Berlin scene now compared to when you were throwing your own parties? Berlin always has been special, very different from other cities. There is a special flair, people were much more ingenious and most of them local. All the parties were really underground and the locations were not more than construction areas with some kind of basement. Nowadays, everything is much more organised, gone are the times of illegal clubs and parties. Clubs and parties are bigger now and more open to the public. Most of the clubs are even mentioned in “Lonely Planet” which is great. A lot of creative people come to Berlin and keep up its culture by just living it up. Music is not yet your full time job. Is it something you would like to make full time? At the moment I do have a full time job. So far both my music and job are working very well together, even though I sometimes wish I had more time for music. But right now both complement each other. It’s like my job is balancing out the creative part of my mind, it works the other way too. This may change but only time will tell. Your Serrage EP was by far TEA’s favourite release of 2010. It was an EP of four quarters with the mechanical Contraire and peak time Rude interlaced between the deeper and dubbier approaches of Cette Nuit and A Plus Tard. Was this something you sat down to specifically create, an EP of four quarters? What I always find exciting when buying records is finding different tracks for different moments. This was a mindset that influenced the tracks on Serrage. When putting together an EP I try to choose a selection of different tracks that will make for an interesting record. This was a goal of mine when producing the Serrage EP. Besides, I don't only want to serve just one genre, I like Techno, House and Dub, the records I make should show that. You seem to have an affiliation with the French, alluded too by many of your track titles. What is the connection there? It's simple. We all just love the French accent and so we often use the French language. It started with the track French Lesson that Mike and I produced together on the Colombage EP. Does this mean that your label night in Paris was a special one? Oh Paris was great. It was such a great time with people dancing and having fun, it was so crowded. We always look forward to playing in Paris. We love the city and its people, going there always gives us the chance of meet other DJ's as well as catching up with friends, it was great chatting to DJ Deep that night, we had an awesome time. 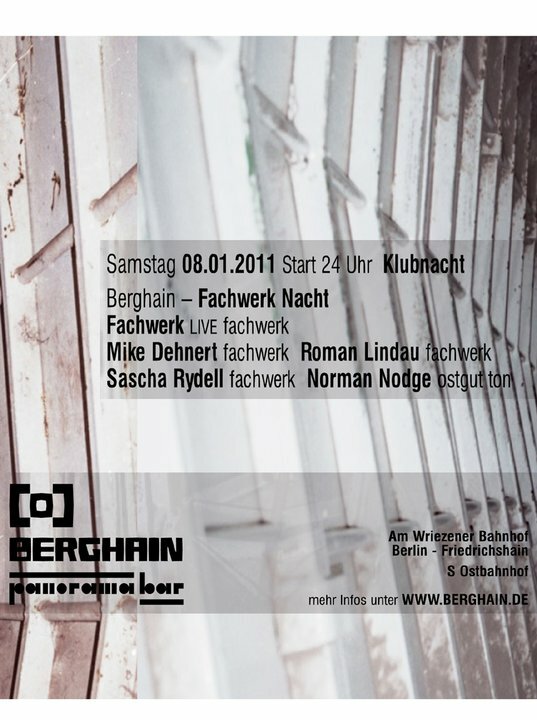 Fachwerk has been on the road so to speak in 2011. How has the reaction been to Fachwerk’s label nights outside of Berlin. We look forward to each label night. It’s always a lot of fun for us to spend time in the clubs, be surrounded by great music and nice people as well as play together. So far the previous label nights this year have been a huge success. I think this proves to us that what we have been doing is turning into a success, this is rewarding as we there is so much passion involved. 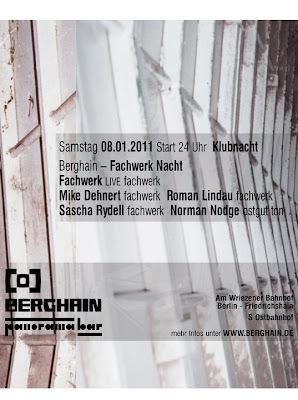 We can take people on a journey with one a night full of Fachwerk. During those label nights the co-operation between the three of us works the same way as our friendship, we complement each other perfectly. Like I have said, we are influenced by a range of different genres and I think this reflects in our DJ sets. There are some more label nights planned for the second half of the year and we are looking forward to London and ADE in Amsterdam in October. What’s next for Sascha Rydell? Fachwerk 19 - Lot De Deux by Roman and Fachwerk 20 - Bricolage by Mike Fachwerk has just been released and upcoming is Fachwerk 21 is due soon. Other then that I am going to contine to work on the live act. I have a lot of ideas in my head so I look forward to seeing what I come up with.